What’s the best way to deal with Shakespeare in the twenty-first Century? It’s possibly one of the first questions that comes to a director’s mind when he considers how he might convey a Shakespearean classic to an audience who may, perhaps, have toiled with the idea of staying home to watch reality television (everyone seems to be at it these days)Sean Turner has directed more than fifteen plays since 2010. 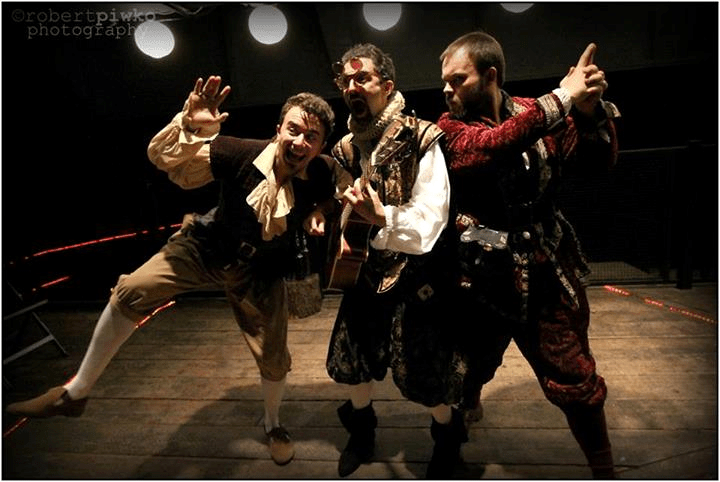 This month he’s teamed up with producers Cat Hodges and Tom Tucker, and theatre company, Permanently Bard, to present his Shakespeare premiere, ‘Twelfth Night or What You Will’, at the presently reformed Rose Theatre on Bankside. The Rose itself has had a long overdue expectation to house Shakespeare’s famously playful and riotous comedy, since the last performance was four hundred years ago. It’s opening night, and the audience is an average age of thirty-two, delicately spread among The Rose’s fifty seat strip. Turner’s version launches, above a peculiar, lamp lit lagoon of mirrored floorspace, to drum and bass music, strobe lighting, and a line of Elizabethan-clad courtiers, D’n’B Stepping. It is promising; exciting, even. Who knows what will happen? If D’n’B music be the food of love, step on. But if Turner thought that introducing a little contemporary vivace before embarking on the playful tragi-com in traditional garb was enough to deem it modern, he might need to change tempo, or the record. Though it’s not a necessity that Shakespeare be modernised for audiences to enjoy, it’s fair to say that if you’re going to do it like this, perhaps update the wardrobe as well. Aside from the introductory reminder of the modern day, the following deliverance is generally a success, even if it’s unclear as to what century we are in. Thankfully, the eclectic cast of PB are compelling enough to enjoy for a hundred or so minutes, embarking with confidence on a play that can go either way in terms of satire or sobriety. Is there a perfect way to deliver Twelfth Night? It is comforting to be in the company of these actors. Demonstrating a wealth of training and skill, they embrace Shakespeare’s jestery with finesse. This can be especially said of Wil Colman, who plays a lithe and ironically pitious antagonist in Malvolio. Deviance dwelling Maria, Feste, Sir Toby and Sir Andrew are unruly in presence, eagerly embracing physical theatre and challenging concepts of audience interaction. Cameron Harle, as Feste, is an incredible indulgence to watch (and hear), and a well rounded supporting character. The most capturing performance of the night is from Jack Harding and Luke Adamson as Sebastian and Antonio, who successfully demonstrate the beguiling relationship the two share during the play. Harding, as Sebastian, is especially compelling and wholeheartedly embracing of Shakespearean sincerity. Esther-Grace Button plays a demurely viable Cesario/ Viola but there’s an slight pantomime presence in the nature of this choice of casting; Button is small in stature, while her other female counterpart, Bryony Meredith, playing Olivia, towers above her, fairing a fanatical hilarity in Olivia’s open affections for the softly spoken servant boy. Meredith, ironically, depicts Olivia, if not a little rustily, as one of the most serious characters in the play. She is beautiful and feminine nonetheless, and fairs a well choiced counterpart for the adoration of the equally handsome Jonathan McHardy, as Orsino, and the stylised Malvolio. So, what do you do with Shakespeare in 2013? Whatever you want, it seems. Just hope that your audience laugh after the lines have been uttered, not before. Turner’s Twelfth Night is successful in this instance, though not without a frown upon his missed opportunity to engage in more D’n’B presence. Composer kudos to Stefan Galt, though, who delivers a continuously sweet melody for guitar lovers when Shakespeare’s said and done. The Rose is a Heritage Lottery funded venue that has more to offer than just plays. Be sure to check out their website for details of open days and other shows. Twelfth Night is showing at The Rose for the duration of November and tickets can be bought here. Be sure to note there are no toilets or any heating inside the venue.